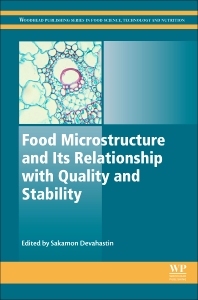 Food Microstructure and Its Relationship with Quality and Stability is a comprehensive overview of the effects that the properties of the underlying structures of food have on its perceived quality to the consumer. The book's first section consists of chapters outlining the fundamentals of food microstructure, food composition, molecular mobility of various food constituents, and their relationships with food quality and stability. The role of various processing technologies in the production of specific microstructures for enhanced quality and stability is outlined. The second part of the book consists of various chapters devoted to microstructures, constituents and their relationship with quality, functionality, and stability of selected foods, for example, food hydrocolloids, frozen seafood, dried foods, extruded products, and dietary fibers. This information is of paramount importance for both academic researchers in the areas of food quality, preservation, and stability, as well as for food developers and processors. Dr. Sakamon Devahastin is currently a professor in the Department of Food Engineering, King Mongkut’s University of Technology Thonburi (KMUTT) in Bangkok, Thailand. His main research interests are in both thermal and non-thermal processing of foods and biomaterials, in particular the development and study of novel drying technologies for heat- and oxygen-sensitive materials, and also in material property and structural characterization as well as computational fluid dynamics and heat/mass transfer. He has so far published more than 150 papers in referred international journals and given some 80 presentations at various international conferences. He is an author/co-author of 13 book chapters, author/editor of three books and co-inventor of 4 patents. He has served as Senior Associate Editor of an archival journal Drying Technology and been on the editorial boards of various other journals in food engineering. Among the many awards bestowed upon him, Dr. Devahastin was awarded the Young Technologist Award by the Foundation for the Promotion of Science and Technology under the Patronage of H.M. the King of Thailand in 2004; the TRF-CHE-Scopus® Researcher Award in Engineering and Multidisciplinary Category by the Thailand Research Fund (TRF), Commission on Higher Education (CHE) and Scopus® as well as the Taylor & Francis Award for Sustained Exemplary Service to Drying Technology and Excellence in Drying Research Contributions by Taylor & Francis, both in 2009. He is the recipient of the 2012 National Outstanding Researcher Award (Engineering and Industrial Research Category) from the National Research Council of Thailand as well as the 2014 Award for Excellence in Drying from the Association Française pour le Séchage dans l’Industrie et l’Agriculture (French Drying Association for Industry and Agriculture). He has been elected Associate Fellow of the Academy of Sciences of the Royal Society of Thailand in 2016. Dr. Devahastin received his Ph.D. in Chemical Engineering from McGill University, Montreal, Canada in 2001.